The Sharp's TakeAway Environmental Return System is free, easy to use and comes with instructions in case you have any questions. Yesterday when I was at CVS, because I have tons of unused medication I need to properly dispose of, on a whim I asked the pharmacist if they took old and unused medications for safe disposal. Was I ever surprised when she told me that they had just started working with the Sharps TakeAway Environmental Return System. When she handed me a big envelope to ship my unused medications to a Sharp's facility for safe disposal, with FREE shipping included, I just about squealed with joy. I cannot believe that it is now forever going to be super easy and super safe to dispose of old medicines with the Sharps TakeAway Environmental Return System. It is vitally important to our health and the health of our environment to not to just flush or toss our expired and unused medications in the trash.. The hormones from the medications that we flush come back to us in our water (as water treatment plants cannot effectively treat the water for pharmaceuticals) and can lead to breast cancer, earlier puberty for girls, lower sperm count, and reduced testosterone levels. Improperly disposing of unused medications not only harms our health, our environment is also harmed through the waste. Just think of how many prescription bottles are tossed in the trash, worldwide, each day. And those prescription bottles take forever, some say as long as 400 years while others say as many as 1,000 years, to break down in the dump. Plus, when the bottles finally break down, the medications inside are absorbed into our earth and groundwater potentially make us sick and harming our wildlife. The Sharp's TakeAway envelope gives consumers an easy, safe disposal option for expired and unused medications and prescriptions. The Sharps TakeAway Recovery System solution is environmentally friendly because the returned pharmaceuticals (along with other medical waste) is repurposed into PELLA-DRX™. a clean raw material used in a variety of industrial applications. PELLA-DRX represents an evolution in the field of medical waste management which includes the repurposing of materials once destined for a landfill into a useful resource. I cannot think of an easier way to safely dispose of all medication (except controlled drugs such as Ambien, Percocet, Ritalin and others) that you need to get rid of. 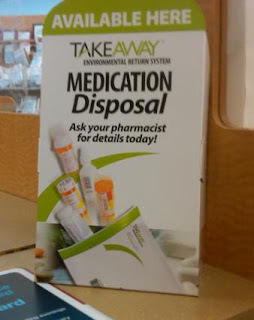 Since the Sharp's TakeAway Environmental Control System does not dispose of controlled drugs, ask your pharmacist whether or not your meds will be accepted. If you do find that you have controlled prescriptions that need safe disposal, you can drop them off at your local law enforcement location that has a "Take Back" program. Oh and remember, if you stop by CVS to pick up a TakeAway envelope, don't forget to pick up your Green Bag Tag and earn cash when you bring your own bag to shop at CVS.